Tomato Trellis increases yields and financial results of a tomato field. Tomato Trellis Netting Reduces Pathogens and Plant Stress. 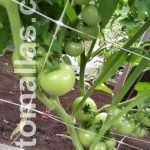 Using HORTOMALLAS as your tutor or tomato trellis will increase overall productivity in your field as the use of net is the easiest way to train tomatoes. 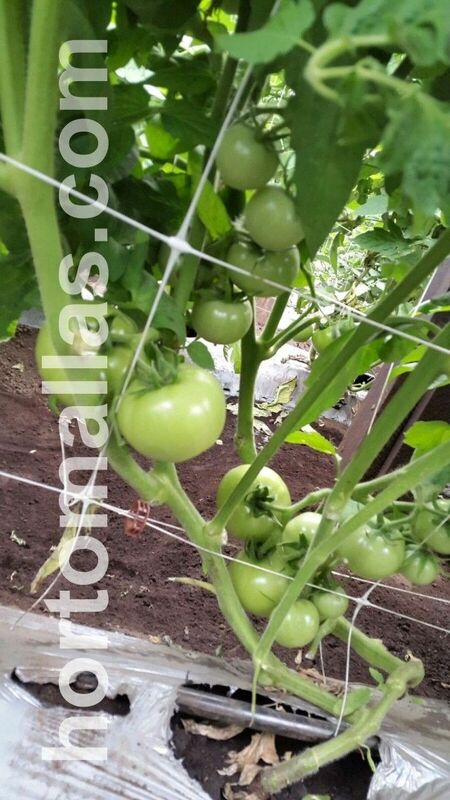 Contrary to raffia trellising of tomatoes, HORTOMALLAS requires a lot less labor both for installing the system and once installed during the field operations of tying and fastening the plant to the raffia tutors. Handling plants constantly for guidance and tutoring will affect their productivity as the mechanical stress due to hand contact and the continuous re-orientation of the leaves will cause the plant to stop producing fruits in order to re-accommodate its leaves towards the sun. Also it is better to avoid so much contact with the hands of the workers because these can be the vector for pathogens transmitted from plant to plant, and this can be achieved by using HORTOMALLAS tomato trellis, as this system allows the plant to grow supported without the need of human guidance. 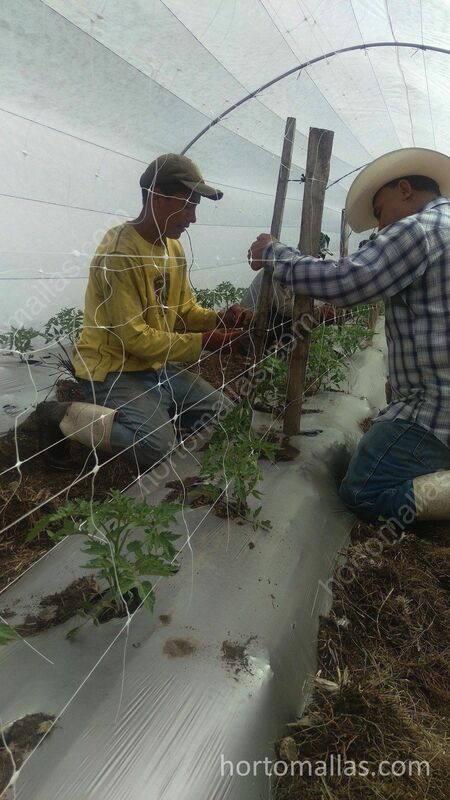 Overall tomato net is advisable as it will increase air flow, decrease fungi attacks, and improve solar exposure, all of this will decrease the need of chemicals, therefore allowing to reach organic crop status. HORTOMALLAS tomato support inside a greenhouse using netting. PS. You say tomatoe I say tomato! Sorry for the “oe” tomatoe-tomato controversy!! 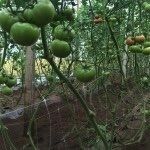 In a tomato crop it is recommended to install a trellis net as a double row, so the plant is better supported from its branches as they lean over the netting. There can be a few reasons why you might not be getting the best from your tomatoes. 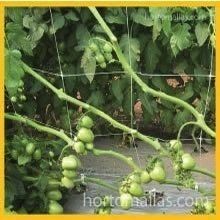 Tomatoes need support and the best option for this is growing trellis tomatoes. The difference between a trellised tomato and a ground grown tomato is the freshness and the quality in the fruit itself. Trellis will give your plants more access to sunlight and air circulation and avoid any pressure points on the tomato from laying on the wet soil. When tomato trellis is up from the ground you have clear access to the roots to water as tomato plants don’t like their leaves watered. There are several ways to trellis tomatoes. You can double wall it which means you plant the tomatoes in the middle of two different walls of trellis. For this support you will need to add some plant clips so there is added support for the trellis. This way also doesn’t require much maintenance as the other methods of supporting tomatoes. If you choose to grow your crop horizontally, this is done by placing the trellis above the tomatoes this will allow the plants to grow along the trellis. V-shape trellises which allows each tomato plant to lean against the trellis naturally and there is no need for other support so you won’t have to tie the plant to the trellis which means less work for you. Is it a must to trellis my tomato plants? There is no right or wrong way and no law that states ‘you must trellis’. It just depends what you want to get out of your tomato plants. When you trellis tomatoes, you give them the ability to soak in the amount of light and air needed by them. If kept away from the damp soil you will end up with a healthy fresh tomato crop. Trellis supported tomatoes will also increase their yield and is able to be used after many grow cycles and can be used for other plants like cucumbers and mini pumpkins as well. You help to lower the mechanical stress of the plants as there is less man handling and you aren’t breaking vines while searching for the ripe fruit. Invest in an insect barrier or anti-aphid mesh. Insect netting is safe for using with trellis. It creates a barrier between the plant and the pests like insects, birds and small animals. Insect netting is ‘see through’ cloth that is UV resistant for the sun rays and is flexible to work with. It can be cut into any size that you need. Sunlight can shine through and water will go through perfectly fine so there is no need to remove the netting before you water the plants. The insect screen is easy to install and comes in a roll for easy transport. Hail protection It might be wise to invest in some hail netting for your tomatoes. The woven netting is lightweight and very flexible. It’s resistant against harsh storms. It serves as hail netting to protect your plants but for shading the plants as well. The hail mesh does not restrict light or air circulation and water will still go through the netting as normal. Does trellis netting help with plant stress? Plants can get stressed with the extra added weight that will start to develop on the vines. When the added weight starts pulling down the plants vines, your tomato plant will get stress. Stress can harm all ages of plants whether they are young seedlings or older mature plants. Stress can also come from handling the plants or pulling back the vines to search for the ripe fruit. The weather can also be stressful to the plant if the conditions are too windy and the tomato plants take the grunt of the wind. You need to avoid stressing the plants out otherwise you will end up with undersized fruit and a reduce rate in yield. If you let tomatoes roam themselves they will rearrange their leaves to get the sunlight and air circulation to the rest of the plant. This also causes too much stress as its rearranging itself outside its natural orientation. Tomato trellis is a better option for improved fruit, not just the look and shape but also the taste and quality. There are many trellising options out there to suit your needs and your budget. You can get temporary trellis or a more permanent structure as well whichever suits your situation. You will enjoy seeing the plant thrive upwards and being able to monitor all the fruit from where you are, rather than searching through leaves and foliage looking for fruit and finding its all rotten.